Dr. Steven A. Witherly is a leading expert in the field of food science, nutrition, and product formulations. His extensive career includes high-level product development positions at many of the world’s most recognized food and health companies and he is an esteemed member of the American Association for the Advancement of Science. With recent news that the federal government is urging Americans to limit their sugar intake to only 10% of calories consumed there are a lot of people left scratching their heads. New labelling mandates could require food manufacturers to denote whether or not their products contain added sugar in an effort to raise awareness. With over 300 million cases of diabetes worldwide and no sign of slowing, it’s time to take a look at what we can do to steer the nutrition ship back on course. There are myriad sweeteners available to consumers, but almost no cohesive summary about what they are and which ones make metabolic sense. This article aims to shed a little light on what’s out there and how sugar alternatives stack up against each other. High Intensity Sweeteners – sucralose, aspartame, stevia, etc. Simple Sugars – sucrose (table sugar), glucose, fructose, etc. Polyol or “Sugar Alcohols” – erythritol, sorbitol, xylitol etc. High Intensity Sweeteners (HIS) are called such because they taste several hundred times sweeter than sugar (sucrose). See the section below for an in-depth look at this category. The HIS are broken down by type, sweetness, caloric value, glycemic index and digestive tolerance. The sterling example from this list is sucralose. It has a very close sugar-like taste and is approved for use in over 100 countries. Stevia also is making headway as a leading sweetener. It’s plant-derived but has a slightly bitter taste if overused. There are three things to examine when categorizing simple sugars: Sweetness compared to sucrose, Energy (calories) and Glycemic index. Since sucrose is a 1 on the sweetness scale, each corresponding number under sweetness illustrates its taste compared to sugar. The calories category, denoted as “kcal/g,” stacks up pretty evenly. The last category is the glycemic index. This is based on the ability of the sweetener to raise blood glucose levels. Glucose is the standard form of simple sugar so it has a glycemic index of 100 and each of the other sweeteners are in comparison to glucose. Of special note in this category is allulose. It’s a low-calorie sugar (only 0.2 cal/g) that occurs naturally in foods like figs and raisins and has a strikingly similar taste and composition to table sugar, but with a low glycemic index. Certain studies have shown that allulose can actually lower blood glucose levels. Although it occurs naturally, allulose has only recently been made available for commercial use by new manufacturing processes. 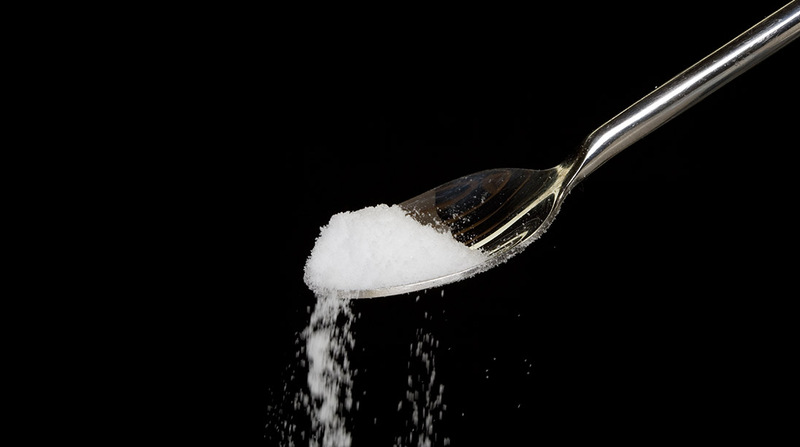 It’s the only one of the simple sugars that has less than a calorie per gram, but because it technically has caloric value, the FDA requires it to be labeled as added sugar.